Have you ever wondered what happens after the fairy tale is over? What "Happily Ever After" really means? In Enchantasia, the princesses of tales - Cinderella, Sleeping Beauty, Snow White, and Rapunzel - rule jointly... and even most villains are reformed. Gillian "Gilly" Cobbler is a thief by necessity, stealing to keep her brothers and sisters fed. 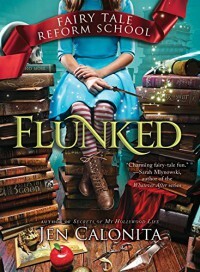 When she's caught for the third time, she's sent to the Fairy Tale Reform School, a boarding school founded by Flora, Princess Ella's wicked stepmother, where the goal is to "turn wicked delinquents and former villains into future heroes." But not all villains have been redeemed, with two in particular still on the loose. Can the troubled teens of Enchantasia come together to fight an evil worse than homework? I found this story really amusing. Gilly is a fun character, and I sympathized with her family situation and how she found herself as an unplanned hero. The supporting cast of Jax, Kayla, Ollie, and Maxine introduces us to different species and personalities within the school, and I can see this group - with Gilly included - in future stories, causing problems as quickly as they solve them. I especially liked how the author twisted our expectations of who is good and who is evil, providing us fairy tale royalty that isn't perfect and villains who aren't actually bad. If you're a fan of fairy tales, magic, and adventure, I highly suggest you pick up Flunked, Fairy Tale Reform School #1. Suggested accessories are a sense of the whimsical, at least a smudge of humor, and a free evening... because you might not want to stop reading! If you enjoyed my review, please help me share it by marking it as "helpful" on Amazon. I have included the link to the Amazon review in the Source section at the bottom of this review.